A Dalhousie M.Sc. 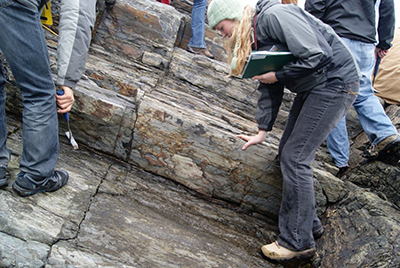 in Earth Sciences will equip you for a professional career in the resource or environmental industries, research or technical positions in government or university labs, or qualify you for a Ph.D. program in Earth Sciences and related disciplines, or further study in Engineering, Law, Education, and other professional fields. M.Sc. admission requirements are explained on the Faculty of Graduate Studies website, where you can also find application forms. A B.Sc. (honours) or equivalent is normally required; excellent B.Sc. graduates admitted to an M.Sc. program may be eligible to transfer to a Ph.D. program after their first year of study. As part of their programs, M.Sc. students are required to take ERTH 6300 (Research Skills), ERTH 6350 (Geology of Nova Scotia), and two other classes. Students also do independent field- and/or laboratory-based research and write and defend a M.Sc. thesis. Most M.Sc. students take about 2 years to complete their studies, depending on their academic backgrounds and requirements of their specific research programs.